Many folks say Mamak is the best Malaysian restaurant in Sydney, we can see why. Miss Chicken gets a rare day off school so we make it a special Mamak day, queue be damned. There's only two of us so we manage to slide past the groups and get seated in under ten minutes, very happy. The Kopi Ais, iced coffee, takes me straight back to Malayasia. $3.50. Miss Chicken's Limau Ais, fresh lime with syrup on ice is wonderful. $3.50. The drinks aren't as uber sweet as we're used to in South East Asia, but that's a good thing. 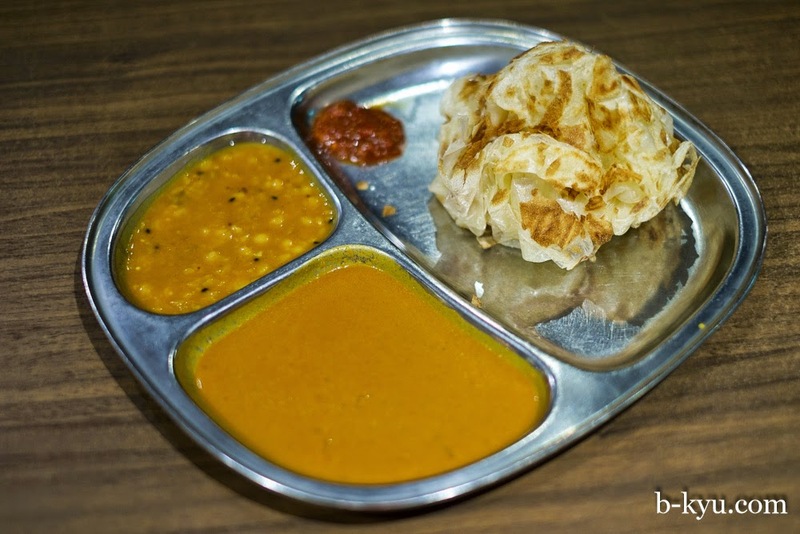 Roti Canai - Malaysian flat bread with two dipping sauces $5. This is the baby I came for, it's excellent, I haven't had roti anywhere near good as this outside of Malaysia. It's light and fluffy and not oily at all, amazing. Roti Bawang - roti with sweet red onions - $6. We get this out of curiousity, it's yum but the roti canai is our fave. Kangkung Belecan - stir fried water spinach with chilies and shrimp paste - $10 as lunch special. This is one of our all time favourite dishes and this version is a winner, they're not shy with the shrimp paste and it has a lovely fresh prawnie flavour. Amazing. Chicken sate - $8 for 6. This is how I remember sate from my travels - sliced thin so the marinade gets right through the flesh, it is so flavoursome even without the dipping sauce. The cucumber garnish dunked in the dipping sauce is divine. When we get to the bottom of the bowl we can see the smooshed up spices. Oh yeah. Around 2pm on a weekday is a good time to beat the queue, sometimes you can just waltz right in, the we prefer to cha-cha. The roti is still great, light and fluffy. Mamak is at 15 Goulburn Street, Chinatown. I'm DYING to go to Mamak. I'm going to take a day off school and go by myself to avoid ALL queues. We went there for the first time on the weekend and it was wonderful. We weren't planning to go there but we were across the road and there was no queue, so we jumped at the chance! The fried chicken is so good, yum! No queue? Did you go and buy a lotto ticket or what?